When will I stop buying plants....this year? The problem is all Amanda's fault. She is attending the local community college and since she still doesn't drive I have to take her and pick her up. No biggie except that between our house and the college is a really nice garden center. Or maybe it is my car's fault....it seems that all I have to do after dropping her off is to think of a plant or comment (to no one but myself) on a plant I see along the street and the car turns into the parking lot of the garden center. Or it could be the fault of the garden center... if they opened up an hour later each morning I would already be home at that time, if they didn't have a 50% off sale on this summers plants going on. But then it could just be that I am weak and even after whining this summer about the death of my garden in the drought, I find that I can not resist more plants. This morning, as a case in point, I found myself sitting in front of said garden center looking at the big yellow 50% OFF signs. After wandering thru the center and passing right by table after table of Pansy...I really do not like Pansies. I found the Herbs....4 small pots of Rue and 2 pots of Fennel jumped onto the cart that I was pushing. I really don't know how I came to be pushing that cart, I was just going to enjoy a few minutes wandering and looking at the plants, but there it was, with 6 small pots of herbs sitting on it and my hands on the handle. Wandering some more I suddenly found the cart now also held an end of season Turk's Cap, two Fall Aster's in lavender and deep purple, a Carolina Jessimine and a miniature Caladium for that little cart I pictured with the birdhouse on a stick in another blog entry. Okay, this is enough I thought and headed for the check out counter....passing some Toadstool statuary on the way. One of the salesmen asked if I could read the price....not referring to my age but the fact that it had been sitting out in the rain and sun for several weeks. I couldn't, he could (okay maybe it was my old eyes) but the price was 10 times what I was willing to pay. He wandered up to the front of the inside store area and found a smaller one for $30....no thank you, I said, if it was under $20 I would.....he said you can have it for $15.....I guess I reminded him of his grandmother which sometimes is a good thing and sometimes just ruins the way I imagine myself looking. So the toadstool piece joined the plants on the cart. At the checkout counter there was a display of mini plants....ornamental peppers and Kalanchoe. I have a really cool green cone shaped planter on a cool stand and this bright red Kalanchoe was just perfect for it. So the newest plants are out back waiting to be planted. But since by buying so many plants over the last two months I have probably assured that we will indeed have a cold winter, I needed pots to put them in so they can be brought into the back room on those freezing nights. Not liking the plain, ordinary clay pots very much I headed off to the thrift stores in search of something completely different. 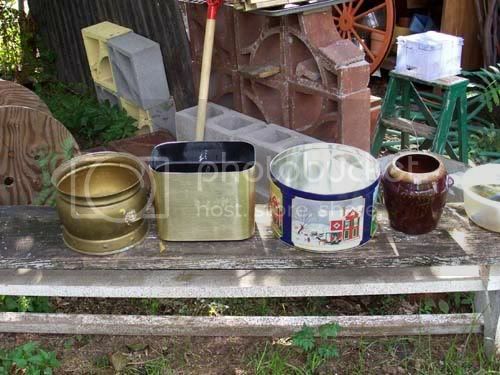 I already had two old stockpots for two of the Rue, these will hold the others. So tonight Randy and his pickup truck will take me to the Home Depot Landscaping center for potting soil. I need about 6 large bags, for these plants and some large Halloween cauldrons I got for transplanting the Lantana this fall. I have three that need to be moved out front but they will spend the winter in the large pots until the front yard is ready for them. Tomorrow I will be potting the newest plants and moving my precious purple Iris. This is the last one, I promise. I have pictures of lots more and they all came out great, but the ones I have entered into my blog are the ones I am most pleased with. 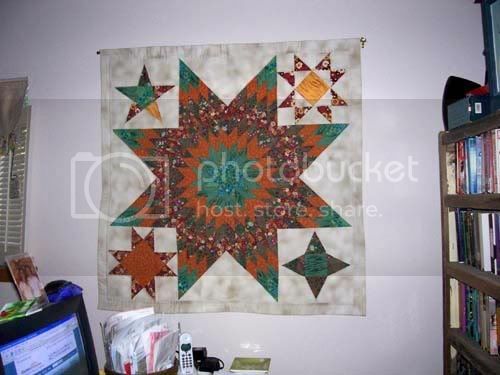 Back in 2002 I entered this one in the Dallas Quilt Show competition. It didn't win anything and this time it really surprised me. I went to the show, saw the winners and know that mine was better made than a couple of them. But then I started reading the makers names and affiliations and realized that, as in a lot of the larger quilt shows, you really should be a member of the sponsoring quilt guild to have a chance. 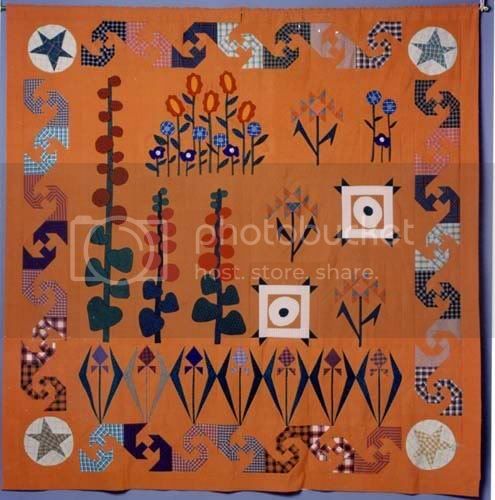 From 2000-2003 there was a line of fabric put out by designer Micheal Miller called Texas Wildflowers...gorgeous stuff. He had come down here in the spring one year, took hundreds of photos along our roadsides of the wildflowers then used them as his inspiration for the fabric. Thousands of yards were sold in Texas alone, the quilt shops couldn't keep it in stock or order it fast enough. Wellllll, almost every entry that won in that contest had used that fabric in someway. The theme for the contest was "Texas Wildflowers" but there was nothing in the rules stating that you had to use that fabric, so I didn't. 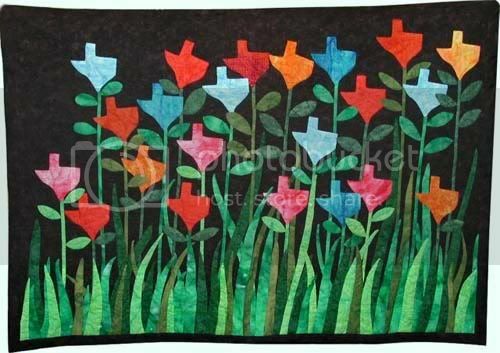 Mine is a play on the theme and titled "Well, you said TEXAS wildflowers"
This one could have had something to do with my needle pushing finger too because every part of the design is hand appliqued, most of the stitches are only 1/8th of an inch apart. The black background is quilted in what is called stippling fashion. The quilting lines meander all over the place and each line is no more than 1/4 inch away from the one next to it and no stitching lines cross anywhere. And all the "flowers" are in colors of the real wildflowers found here. The photographer friend of ours who took the pictures of all my contest quilts, bought this one from me after the competition. 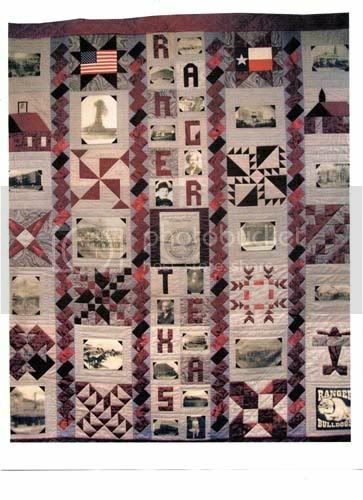 In 2001 I was asked to design and make a raffle quilt for the historical society where my Mom lives. Everyone on the board has been to my Mom's house and seen all the quilts she has that I have made her. I was excited to do it but by early Sept,2002 I was so tired of that quilt. The board gave me various photos to put on fabric and my Mom bought all the fabric for it. I chose several quilt blocks who's names related to Ranger's history in some way....Indian Trails (one went thru the area before the town sprang up), etc. Piecing the top went pretty easy but the hand quilting took 6 months of working on it about 8 hours a day. This is the quilt project that damaged my needle pushing finger and brought my quilt making to an end. It is done in different shades of maroon and gray, those are the colors of both the Ranger high school and Ranger Junior College and is a large king size. In the center next to the last letter R in Ranger is a picture of my Great-Grandfather. He was an oil well shooter back in the first half of the 20th century and made nitro glycerine in the bathtub in his house. I gave it to the society president in early Sept, they sold $2000 in raffle tickets. The local bank president won it but donated it to the historical society to hang in the museum they recently opened. This is my folk art double log cabin and trees. 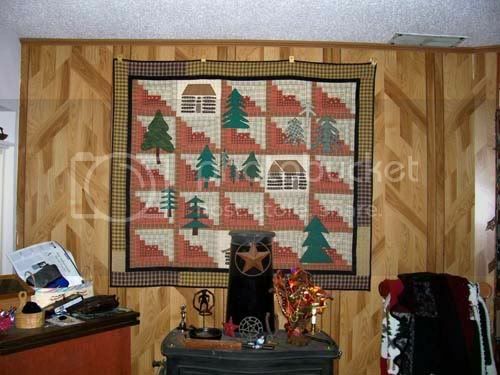 The background blocks are called Log Cabin, with machine applique log cabins and trees. Hanging in the livingroom behind the non-working wood burning stove. This one was made to be a curtain for the sliding glass patio door off the kitchen. It was there for years and is now hanging on the wall of my craftroom. Those bright square within a square flowers are supposed to be primroses, sure wish I had used a darker fabric, this one looks like dayglow. The second contest entry I made didn't win anything but it did get invited to spend July 7th,2001, hanging from a tree in the north woods of northern Wisconsin viewed by over 1200 visitors to the woods and have a chance to win. When I sent them the wall hanging I included a disposable camera and asked if someone could take pictures of some of the quilts on display and mine of course. There were several quilts that were just drop dead gorgeous so I do understand why mine didn't win. They also sent me a show booklet with the descriptions and narratives of all the quilts. I wasn't the only one who submitted a really long narrative....next years contest rules specified that the narrative could not be more than 150 words. The Trees for Tomorrow organization in northern Wisconsin sponsored the contest "A Walk thru the Northwoods" Having never taken a walk thru the north woods I had to really use my imagination. 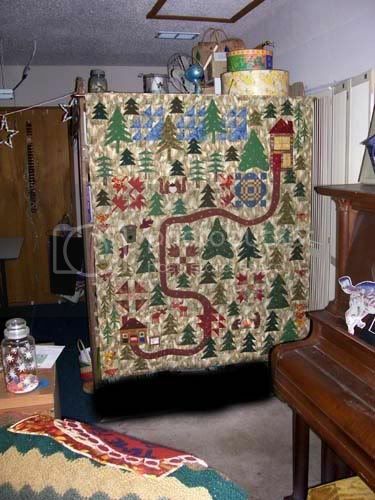 My entry was titled "One Day a Texas Quilter Took a Walk Thru The Northwoods" The narrative begins at the cabin in the upper right and ends at the quilt shop at the lower left. The words in quotes are the names of quilt blocks or applique animals scattered among the pine trees. A cold "North Wind" blew in during the night bringing the first snow of the season. It's early this year and starting to come down heavy at times. I need to make a trip to the store for the necessities of life before the snow makes traveling impossible. I love making this trip in any season of the year but especially in the late fall/early winter. Everything is so quiet, the wind blowing thru the pine trees is heavenly music. My favorite "Goose on the Pond" has finally flown off to warmer weather. I can hear her and a few other late travelers honking in the distance. I will miss her good morning greeting but she will be back in the spring. The "squirrels" are busy gathering up any nuts hidden under the newly fallen leaves. My part of the woods is mostly evergreen trees so these "Maple Leaves" must have blown in from further north last night. Even the "birds" are heading indoors today. The snow isn't as heavy over here, I can still see the tracks made by "Bear Paws". The "Duck and Ducklings" left the area several weeks ago, but there will be more in the spring. The "mooses" (moose..meese..I can never remember what the plural of moose is) don't seem to be bothered by my being here, guess they are finally used to having me around. I love all the trees I have in this part of the woods..so many different kinds, all the shapes and the variety of greens are just gorgeous especially with the large fluffy snowflakes landing on their branches. There are some "Turkey Tracks" almost hidden in the trees, hope the turkeys that made them are hiding too, Thanksgiving is just a few weeks away. Now, why in the world are there "Hovering Hawks" over the path? Good thing I thought to bring my umbrella with me :) Well, I'll be.....so THAT's what "bears" do in the woods when humans aren't around. I'll just tip-toe quickly and quietly passed them. The store is just around the bend, I can get a cup of hot coffee, stock up on the supplies I need to make it thru the long winter ahead and get back home. 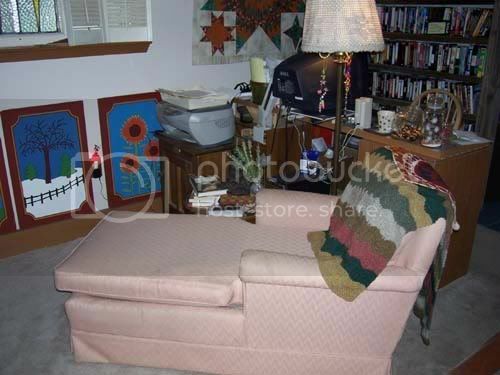 Between January 1986 and January 2003, I was an avid quiltmaker. If I could remember all the quilts I had made, ranging in sizes from 40 inch square wall hangings to kingsize bed quilts, I could probably come up with around 200. This is the first wall hanging I made as a contest entry. The fabric maker, P & B Textiles, produced a series of fabrics with wildflower prints and several coordinating tone on tone prints and solids. Back in the 1960's when Lyndon Johnson was the US president, his wife Ladybird started a program to get states to sow wildflower seeds along their highways. I don't know about other states, but Texas highways are absolutely gorgeous in the spring because of it. 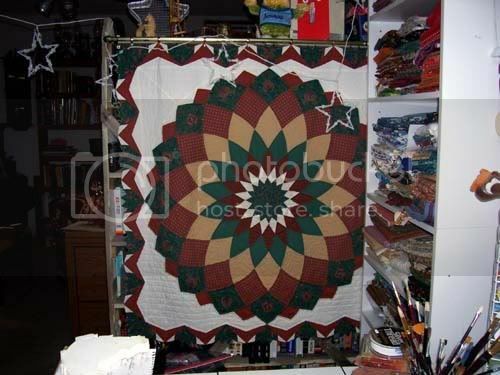 The four stars at the corners have also been called The Lone Star by quilters over the last 200 years. By the way, Texas is the Lone Star State because our state flag has one large white star on a blue field down the left side of the flag, the right side being divided into to horizontal rectangles - the top is white and the bottom one is red. Anyway, the wall hanging is titled "Thank You Ladybird Johnson"
I submitted a picture and it was selected for the final judging. It won an Honorable Mention and spent that next year traveling with the other winners to quilt shows around the country.